. And, we do Catering! obby Rydell slips in the back door at Narberth’s American Family Market, picking up his New York strips fresh off the butcher block where Paul Bovo was trimming them moments before. No fuss, no muss. On the other side of the deli case, the customers don’t even spot kiln, tucked under his ball cap, swathed in an Eagles-green jacket — one of the guys, an ordinary Joe, a regular. The back workshop-salon is one of American Family’s secret weapons, the butcher block playing the role of cracker barrel. There are others: On a given day, a box of warm, home-baked cinnamon buns might show up. Or veteran employee Joe Kelly will be running a batch of thick-sliced fried eggplant, so lush and redolent with Italian seasoning you end up eating it in the aisle. Or Paul will share his mother’s recipe for oil-and-red-vinegar potato salad. 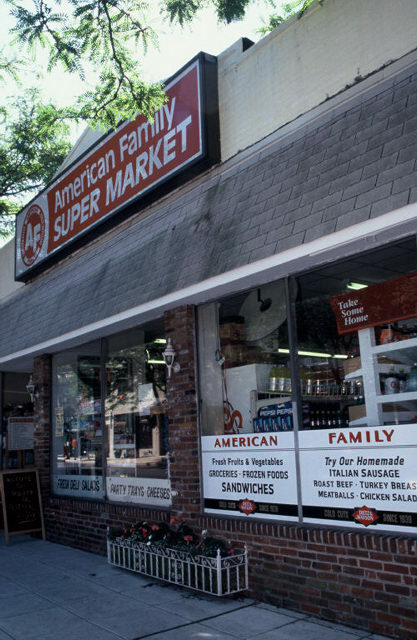 Thirty-six years now, the American Family (A.F., to the locals) has been holding down its spot at the epicenter of Narberth borough, a rare bird on the Main Line, a species vanishing from the landscape — the small-time, independent, family-run supermarket. There are plenty of other places to buy groceries within a couple of minutes’ drive. You’ve got your chains — Acme, Super Fresh, Food Fare. You’ve got your “convenience” stores. You’ve got cheaper; you’ve got fancier: I counted seven brands of smoked salmon at the Fresh Fields in nearby Wynnewood the other day, not to mention the organic Arauco olives with rosemary, red carrots and fresh sushi. American Family’s produce bin is short and to the point. The aisle-ender displays are for Jell-O, not green-tea chai. The canned tomatoes are no big bargain. But among other things, I can walk to it for a tub of fresh-made chicken salad, and walk home again — a soothing ritual, the value of which cannot be overstated. Once, of course, Narberth was bound close by a pedestrian ethos born more of necessity than choice. Go back to the 1930s and ‘40s, when there were fewer cars, no shopping centers. Main Street had a far different cast. There was Max’s Market, where the bike shop is now. Howard Cotter sold groceries and vegetables where Mape’s sells cards. Down by the hair salon was Freeman’s, known for its meats. Within a block or two, you could pick up groceries at Kerner’s, Miller’s Deli, Jim Phelan’s place, J.J. Whiteside’s, and the A&P, whose body came to be inhabited by American Family, the last of the Mohicans. There are, besides the encircling chains, boutique farm markets, too, one on Montgomery Avenue that has terrific fresh tuna, another in Suburban Square in Ardmore where they stock more artisanal Spanish cheeses than I’ll ever be able to pronounce. But I find myself drawn to American Family for what it carries exclusively — the pork loin Paul splits and stuffs to order with garlic and sage; the hands-on celery-chopping tips from Ted, the local bartender; Angelo’s learned discourses on why the drier heel of the baked ham has the flavor-enhancing advantages you get from aged beef. Some days, squares of tomato pie get passed around from Cacia’s, the South Philly bakery. You’ll run into a Wharton professor holding forth on his latest European gastronomic tour. Or, now and then, Bobby Rydell in an amiable mood. They don’t stock an inventory like that at the markets with the one-way mirrors, antiseptic aisles, and chill at the checkout counter. That’s why American Family’s value is unbeatable still, harder to find these bountiful days than the finest cornichon, spinach quiche or rosemary olive.